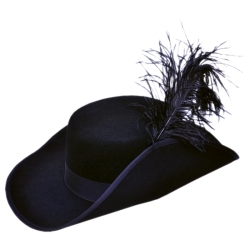 Deluxe Cavalier / Musketeer hat. 100% quality wool felt with a real leather band. Includes plume feather. Available in Black. Sizes: medium, large & x-large.